I am a scented candle fanatic - I've been known to bring my favourites, by Diptyque and Cire Trudon, away with me on holiday! But in recent times it has seemed a bit obscene to shell out €50+ on something that will quite literally go up in smoke - so I've been on the lookout for something a little more affordable, but that still feels luxe. Enter new Irish brand, La Bougie. They launched on Valentine's Day this year and offer three unique scent varieties, created by their house perfumer from scratch: Sweet Pea and Pear, Cox and Carnation and Rockrose and Oudh. A lot of love goes into these candles: each one is hand poured into glass jars that are carved, painted, and polished by craftsmen at the West Cork chandlery. They come in three sizes: valise (wax weight 130g, €25), salon (210g, €35) and longere (270g, €50). Quality wise, La Bougie candles are up there with the very best. Attention to detail is second to none: I was sent a salon sized candle in Rockrose and Oudh, which arrived in a chic black paper bag, wrapped in scented tissue paper and hand-tied with an ivory grosgrain ribbon. The scent reached me before I'd even opened the bag. Oudh, also known as agarwood, is a costly, aromatic oil with a heady, exotic scent. Married with rockrose and ylang ylang, this candle is warm, floral and sensual and fragrances the entire room, without being overpowering in the least. 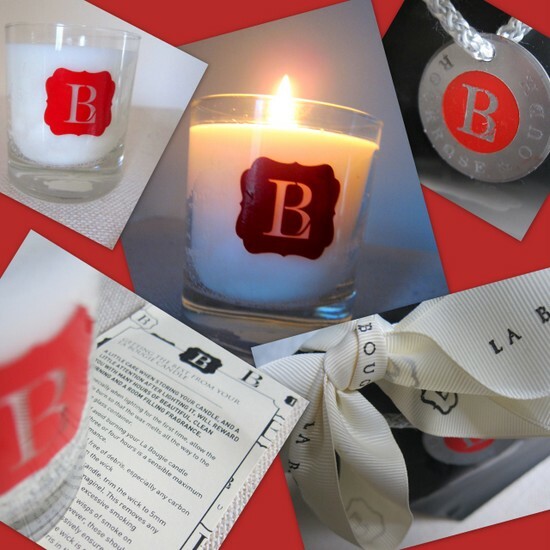 La Bougie candles offer affordable luxury and would make a fantastic gift (or self-gift!). Handily, the company delivers all over the world - check out the website or Facebook page for more information, or contact them on customerservices@labougie.com. And for more great Irish brands, check out the previous posts in the Made In Ireland series here, here and here. Are you a scented candle fan and if so, which are your personal faves? I'm a huge scented candle fan. My long-tome favourite is Baies by Ditypque. I wear the perfume of the same scent in Winter (it's a little heavy for summer). Oyedo by Diptyque is another favourite too. I haven't splashed out on them in a while though, so might give these guys a whirl. Dena - re the Ditypque candles, every single time I see the Baies one, I read it as Babies, without fail, it's the way the letters are laid out, I swear! I have never brought myself to shell out on a dipytique one even though I always go into the shop and inhale all my favourite scents! Love to see Irish companies doing well too! I adore scented candles...these look amazing! lol. go up in smoke. lol. scented candles really give something extra to the room and to your general feeling. Ooh Sweet Pea & Pear, sounds fabulous! This will have to be hidden in my Boudoir! It's hard from me to deviate from Yankee where candles are concerned, but I do love a good Irish made brand. There's nothing like a lovely candle to make a room special! love this candles and also your blog! It's so nice!!! I follow you! These look lovely Emma - will definitely invest ! I love scented candles and always have some burning, although it tends to be more often during the Winter. I'll have to take a look at these. I could spend so much money on candles...and they are so worth it! I actually need to get my shop on and grab some newbies! I am very impressed by your dedication to making these little masterpieces. The scents available are also not half-bad either.